More fun in Judith's workshop today. At points I had to park my spinning real quick to take notes. I suppose I could have gotten more spinning done, but there way so much good information flying around that I wanted to capture. I have 4 pages of various quotes & notes. The quote for the day from Judith is "Twist is like glue. It's what holds everything together." 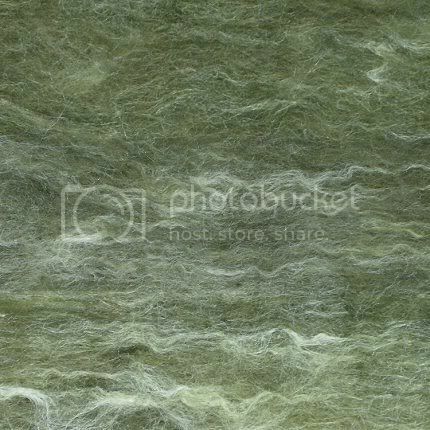 Here's a picture of yesterday's 2 ply Bombyx that garnered praise from Judith. I'm very pleased that I just whipped this really nice yarn off in class. It really is 2 ply, I swear - I have witnesses and everything ;) I have no idea what the wpi is. We worked on my nemesis this morning, the silk caps she dyed yesterday. 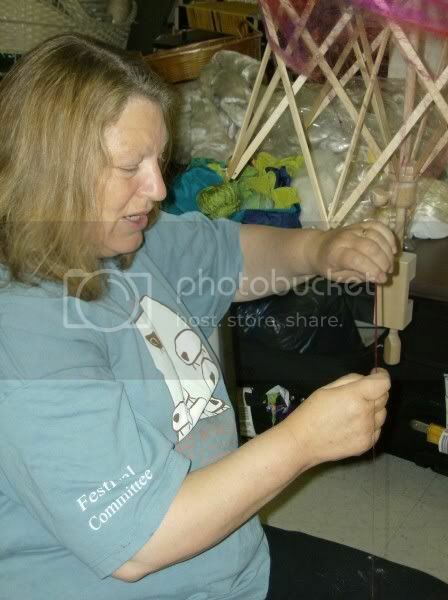 Judith gave a great demo of stretching and spinning caps using a swift as a distaff. I had a lot of fun with is, and am actually looking forward to dyeing and spinning some caps. 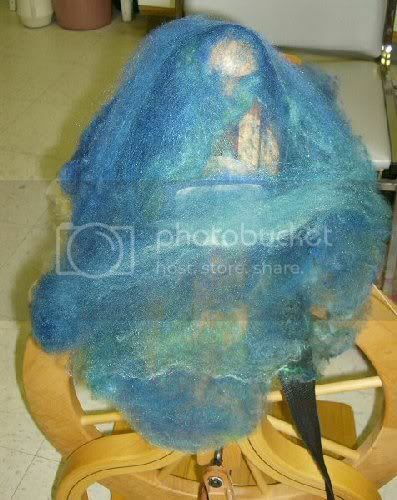 I spun some of the lovely blue & cyan silk. I'm looking forward to getting the rest of my sample spun up and plied. Since we didn't all have swifts to use, I pre-drafted mine on to an arm of my niddy-noddy. The colors are fabulous. It spins up into a lovely textured yarn. We had a great discussion about the tricks, difficulties, and beautiful results of dyeing silk. Which included a chat about the properties of silk and how other fibers take dye differently. 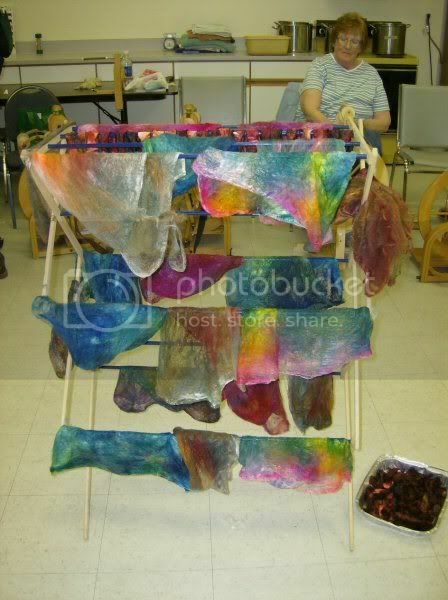 I brought some of my own dyeing and blending experiments in today to show Judith, which got passed around as examples. The silk, alpaca, and merino take the same dye differently. It all blends together very nicely and is going to make a great sweater yarn. Not to mention sage green is one of my favorite colors. 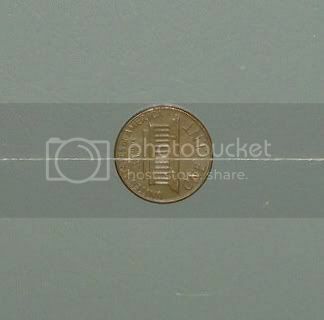 I have a pound and a half of this in a corner of the living room waiting to be blended. We painted some silk and silk merino roving during class. I'm looking forward to seeing how it turns out tomorrow. A****** and I both tried to get the spiffy copper & bronze colors, which seem to be a combination of yellow, magenta, brown, and cyan. The complex colors can be tricky to get when you want them. When we were on the topic of alpaca, Judith pointed out there is a difference between 'American alpaca' and alpaca in the rest of the world. Traditional alpaca is straight and silky, whereas here in the US a softer, more crimped version is becoming more popular. She said ours is much more like cashmere than the fiber in other countries. 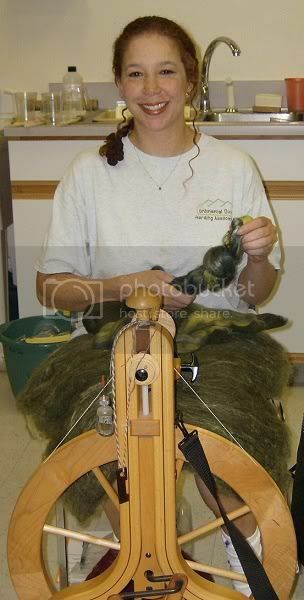 Judith agreed when I said I thought that handspinners have influenced what American alpaca growers are producing. 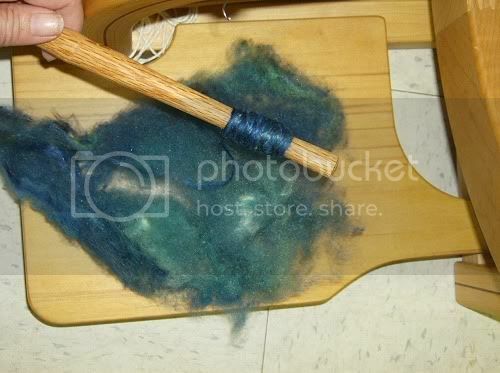 Many people prefer to spin the fiber with a softer handle. She also pointed out the fiber industry is not so happy with this trend because the fiber doesn't meet their standards and doesn't work well in the machinery set up for standard alpaca. Of course, I got my other Tour spinning in today. And that green is...it's...it's...wow. Stunningly gorgeous.